It also provides facet counts, so you can tell how many results you will get back before you apply one of these filters—and get a general feeling for the shape of the corpus as you navigate it. 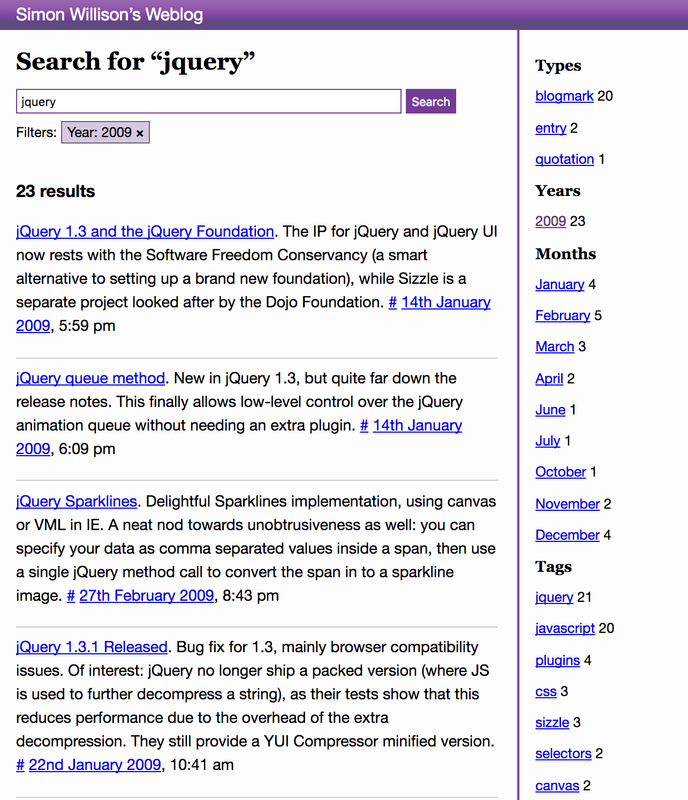 I usually build faceted search engines using either Solr or Elasticsearch (though the first version of search on this blog was actually powered by Hyper Estraier)—but I’m hosting this blog as simply and inexpensively as possible on Heroku and I don’t want to shell out for a SaaS search solution or run an Elasticsearch instance somewhere myself. I thought I’d have to go back to using Google Custom Search. Then I read Postgres full-text search is Good Enough! by Rachid Belaid—closely followed by Postgres Full-Text Search With Django by Nathan Shafer—and I decided to have a play with the new PostgreSQL search functionality that was introduced in Django 1.10. … and wow! Full-text search is yet another example of a feature that’s been in PostgreSQL for nearly a decade now, incrementally improving with every release to the point where it’s now really, really good. It needs to take user input and find matching documents. It needs to understand and ignore stopwords (common words like “the” and “and”) and apply stemming—knowing that “ridicule” and “ridiculous” should be treated as the same root, for example. Both of these features need to be language-aware. It needs to be able to apply relevance ranking, calculating which documents are the best match for a search query. It needs to be fast—working against some kind of index rather than scanning every available document in full. Modern PostgreSQL ticks all of those boxes. Let’s put it to work. The SearchVector class constructs a stemmed, stopword-removed representation of the body column ready to be searched. The resulting queryset contains entries that are a match for “django”. Update 6th October 8:23pm UTC—it turns out this step is entirely unnecessary. Paolo Melchiorre points out that the PostgreSQL ts_vector() function already handles tag removal. Sure enough, executing SELECT to_tsvector(’<div>Hey look what happens to <blockquote>this tag</blockquote></div>’) using SQL Fiddle returns ’happen’:4 ’hey’:1 ’look’:2 ’tag’:7, with the tags already stripped. This works, but performance isn’t great. PostgreSQL ends up having to scan every row and construct a list of search vectors for each one every time you execute a query. Django’s migration system will automatically add both the field and the special GIN index. I’m using a neat feature of the SearchVector class here: it can be concatenated together using the + operator, and each component can be assigned a weight of A, B, C or D. These weights affect ranking calculations later on. We could just set this up to run periodically (as I did in my initial implementation), but we can get better real-time results by ensuring this field gets updated automatically when the rest of the model is modified. Some people solve this with PostgreSQL triggers, but I’m still more comfortable handling this kind of thing in python code—so I opted to use Django’s signals mechanism instead. As you can see, I’m including the tags that have been assigned to the quotation in the searchable document. (The full code can be found here). The on_save method is pretty straightforward—it checks if the model that was just saved has my BaseModel as a base class, then it calls make_updater to get a function to be executed by the transaction.on_commit hook. The on_m2m_changed handler is signifcantly more complicated. There are a number of scenarios in which this will be called—I’m reasonably confident that the idiom I use here will capture all of the modifications that should trigger a re-indexing operation. We now have basic full text search implemented against a single Django model, making use of a GIN index. This is lightning fast. My site has three types of content, represented in three different models and hence three different underlying database tables. I’m using an abstract base model to define common fields shared by all three: the created date, the slug (used to construct permalink urls) and the search_document field populated above. As of Django 1.11 It’s possible to combine queries across different tables using the SQL union operator. This is not enough information though—I have the primary keys, but I don’t know which type of model they belong to. In order to retrieve the actual resulting objects from the database I need to know which type of content is represented by each of those results. and a 'pk' key. Returns a list of ORM objects of those various types. Each returned ORM object has a .original_dict attribute populated. So far, our search engine can only handle user-entered query strings. If I am going to build a faceted search interface I need to be able to handle filtering as well. I want the ability to filter by year, tag and type. The key difference between filtering and querying (borrowing these definitions from Elasticsearch) is that querying is loose—it involves stemming and stopwords—while filtering is exact. Additionally, querying affects the calculated relevance score while filtering does not—a document either matches the filter or it doesn’t. Since PostgreSQL is a relational database, filtering can be handled by simply constructing extra SQL where clauses using the Django ORM. Each of the filters I need requires a slightly different approach. Filtering by type is easy—I just selectively include or exclude that model from my union queryset. There is just one more ingredient needed to complete our faceted search: facet counts! Tags are trickiest. Let’s take advantage of he fact that Django’s ORM knows how to construct sub-selects if you pass another queryset to the __in operator. I am using custom templates tags here to add arguments to the current URL. I’ve built systems like this in the past where the URLs are instead generated in the view logic, which I think I prefer. As always, perfect is the enemy of shipped. And because the results are just a Django queryset, we can use Django’s pagination helpers for the pagination links. The full current version of the code at time of writing can be seen here. You can follow my initial implementation of this feature through the following commits: 7e3a0217 c7e7b30c 7f6b524c a16ddb5e 7055c7e1 74c194d9 f3ffc100 6c24d9fd cb88c2d4 2c262c75 776a562a b8484c50 0b361c78 1322ada2 79b1b13d 3955f41b 3f5ca052. And that’s how I built faceted search on top of PostgreSQL and Django! I don’t have my blog comments up and running yet, so please post any thoughts or feedback over on this GitHub issue or over on this thread on Hacker News. This is Implementing faceted search with Django and PostgreSQL by Simon Willison, posted on 5th October 2017. Next: Should I build my startup's web-based product as if it's going to one day be widely adopted and experience high-volume, or instead focus on quick delivery over scalability?